My mind is pretty much fried. I'm ready for summer, though the weather could wait, or at least gradually work it's way up to triple digits. Come on it's only April! And so due to the heat, and total lack of motivations I bring you this ridiculous mini post. This guy is just embarrassing. 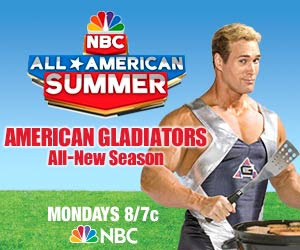 For those that have found their way over to this blog from my old xanga, you guys know how I feel about this guy and the "return of Gladiators." I have no words to describe this...Gay-diator.